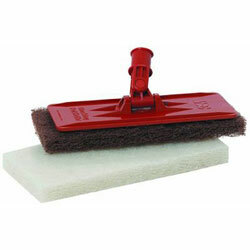 3M Insta-Lok Doodlebug Pad this holder has a swivel head and is most commonly used with a 1-1/8 inch by 5 foot wooden broom handle, which is not part of the package. The orange plastic holder with special grippers that hold 4.625 inch x 10 inch 3M™ Doodlebug trade; Cleaning Pads. Holder swivels in all directions. White pad designed for light cleaning. Works best on delicate surfaces-windows, ceramic tiles, walls, floors & swimming pools. Shurhold Fixed Length Handle with Finger Grip - 30"